If you stopped watching the NBA Playoffs when our depleted Bulls were bounced last week in round two, you may want to consider tuning back in starting tonight as the Eastern Conference Finals are about to get underway. The post season is far from over as four teams remain (down from the original 16) and are looking to advance to the NBA Finals, the final round of the NBA Playoffs. In the Western Conference, the favored San Antonio Spurs are facing off against the underdog Memphis Grizzlies and already have a 2-0 lead in the series. In the Eastern Conference, for the second year in a row the top seeded Miami Heat find themselves going head-to-head with the third seeded Indiana Pacers. That’s right, two of the Bulls biggest rivals will face-off to claim their throne as the biggest beasts of the East and continue their quest to an NBA title. Let’s take a closer look at this interesting Eastern Conference matchup that is sure to keep Bulls fans tuning in just a little longer. On one end of the court you’ll find the Pacers who have the league’s best defense led by big nasty Roy Hibbert and on the opposite side you have the defending Champion Miami Heat with the hottest commanding offense in the NBA led by four-time MVP Lebron James. Will the Pacers tough antics rattle Miami’s nearly perfect offense? We will soon find out. Here’s the need to know information for round 3. Read the entire Eastern Finals Preview with Key Players, need to know facts and predictions at SportsDivasInc.com via Eastern Conference Finals Preview: Miami Heat vs Indiana Pacers | SportsDivas Inc..
Last night was the 2012 NBA Slam Dunk contest, which in my opinion is one of the most entertaining sporting events to watch – especially during an all-you-can-drink package at your favorite local establishment. This year’s contestants really got creative and were refreshingly less cheesy than Blake Griffin’s over-the-car dunk from last year. 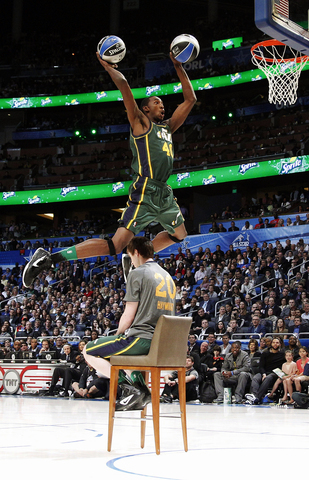 In the end, Utah’s Jeremy Evans took the cake. Evans, got into the competition as a replacement for injured New York guard Iman Shumpert. Reports show he earned 29 percent of the 3 million votes cast. He beat out Houston’s Chase Budinger, Indiana’s Paul George and Minnesota’s Derrick Williams for the Jazz’s first-ever trophy in the contest. 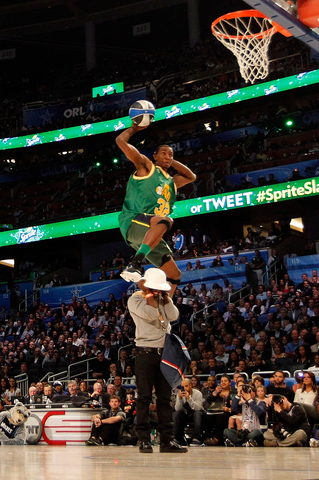 Evans dunked with a camera on his head, slammed two basketballs as he soared over a seated assistant and rocked a Karl Malone jersey to dunk over comedian Kevin Hart (celebrity all-star MVP) dressed as a mailman. 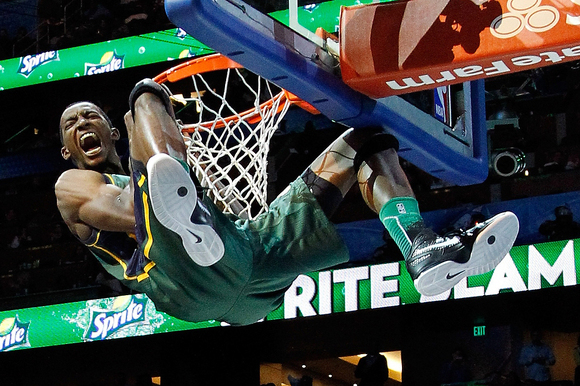 Another one of my favorite dunks of the night was when Budinger jumped over Mr. P.Diddy. The fact that anyone can jump over another man is unreal, I can’t even jump up 6 stairs. Jumping over men seemed to be the theme of the evening as Indiana’s Paul George also jumped over two large guys, his Pacers teammates Roy Hibbert and Dahntay Jones.